One night I recently had some spare time and decided to start surfing youtube for cheesy aviation movies. Wow, did I find some cheesy aviation movie gems. The movies I found were primarily made for television from the 1970s and if it were not for youtube, they seriously would be forgotten movies. One particular movie I was most fascinated by was a true story, The Ghost of Flight 401. I found it so fascinating, after watching the movie, I wanted to know more. 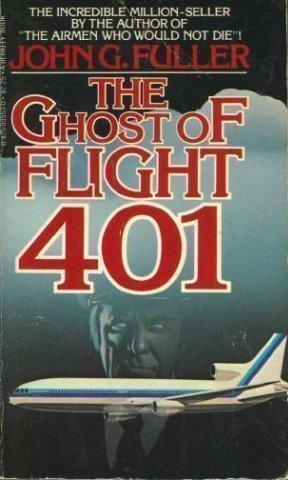 As a result, I purchased The Ghost of Flight 401 written by John Fuller. The book covers the aircraft accident in a lot of detail, but the actual aircraft accident is only part of the story, just as is portrayed in the movie. The book focuses more on the author and several other people voluntarily helping him gather as much factual information as possible. A few airline employees, including pilots, mechanics and flight attendants helped with the gathering of facts about various experiences. The author makes it very clear he was very skeptical about ghosts and various types of experiences before starting his investigation. John Fuller was renowned for serious pieces of written work, such as “We almost lost Detroit”. A true story about how Detroit was almost lost to a serious nuclear accident. I was certainly not aware of that and believe it is very safe to say John Fuller took his written work very seriously. While the author was travelling across the United States and Europe promoting his new book about Detroit, he inquired with cabin crew if they had heard anything about the ghosts seen on Eastern airlines. To much of his surprise, European cabin crew had heard about the ghost sightings. This story had spread across the Atlantic to Europe. John Fuller noted when stories or folklore are told, they generally take on a local flavor. In other words, stories usually tend to be slightly modified to suite the local story teller. Not in this case. It did not matter who was reciting the story, Americans or Europeans working for any airline, the story was always about Eastern airlines L-1011s. I believe this may have been one of many reasons for John Fuller to start taking these stories seriously and actually make an effort to really look into this. The ghost stories had an effect on airline employees in many different ways. Anyone who officially reported the sightings in aircraft logbooks were required by management to see the company psychiatrist. Of course word spread of this very quickly, as many people feared for their job. No one wanted to lose their job, so naturally as a result, many employees officially stopped reporting the ghostly sightings. This is an huge unfortunate mistake taken by Eastern airlines upper management, not just from the sightings perspective, but from a flight safety perspective. As an airline, you always want crew members to report anything out of the ordinary. Some employees were frightened of the ghostly sighting stories and tried to avoid the L-1011s. It seems those who were frightened were understandably afraid of the unknown and unexplained. Other airline employees wanted to experience the ghostly sightings and would bid to try and get on to the L-1011s where sightings had already occurred. Upper management just wanted to stories to stop, as they were primarily concerned about the public impression of Eastern airlines. Due to the stance taken on by upper management, the investigations were forced to keep a low profile. The author admits he was surprised to find how many technically minded people were naturally open to the idea of the paranormal. Pilots, mechanics, ticket agents, flight attendants and also a member of the FAA. I too was pleasantly surprised, only because the airline industry is naturally very technical and procedural in its normal operating environment. The ghostly sightings were mostly of Second officer Don Repo from Flight 401. The Captain of Flight 401, Bob Loft, occasionally appeared, but not as frequently. There were never any sightings of the First Officer of Flight 401. The sightings only took place on L-1011 aircraft owned by Eastern airlines. They were sighted on L-1011s leased to other airlines, which were owned by Eastern airlines. The ghostly sightings only took place on L-1011s which had parts installed that were taken from Flight 401, the L-1011 that crashed in the Florida everglades. The parts taken and tested from Flight 401 were not flight critical components. The parts included things like oven doors and entire ovens for reheating food. Everyone familiar with Don Repo knew he was a joker and he absolutely loved the L-1011 aircraft. He knew the aircraft very well indeed. At times Don Repo appeared, he warned of potential dangers to the aircraft. One such occasion he warned a flight attendant of a particular oven potentially starting a fire. A Captain was warned by Don Repo sitting in the jump seat to check a specific system and a critical fault was found. Another Second Officer, when he went down to the galley, was warned by Don Repo of a potential engine fire, before it actually happened. No one had any doubts, Don Repo was trying to help people, not frighten them. Most people believed Don Repo wanted everyone to know the L-1011 was a very safe aircraft and that there was nothing wrong with the aircraft when it crashed. All of the pilots and flight attendants were completely satisfied and truly felt the L-1011 was an incredibly safe and reliable aircraft. Not to mention luxurious for the time. The book goes into a lot more detail than the movie portrays, which is common. Movies have time limits, books do not. If you find the idea of ghostly sightings on aircraft fascinating, I recommend taking the time to read this book. I’ve always found the likes of mysteries and the unknown fascinating. I would like to thank Scott from Norebbo studios for the wonderful 2D Eastern Airlines L-1011 images. There are many airliners with incredible detail and paint scheme to be found on this website. If you are into airliners and digital modelling, its worth checking out.